During his life, Francis de Sales had a gift for giving spiritual direction to lay people living ordinary lives in the world. He firmly believed that everyone could grow in holiness, even while engaged in very active occupations, and his books and volumes of letters addressing this need remain beloved works to this day. What is the secret of their longstanding value? It is the intimacy and at the same time practicality of the saint's direction -- for he speaks to us person to person. We recognize ourselves in what is said because he speaks of those things that each of us has experienced. This collection of maxims and sayings gathered from his many pages of spiritual counsel are words of advice that every friend of St. Francis has always been fond of repeating -- words that serve as means of encouragement, points for meditation, counsels, exhortations, reminders. For St. Francis speaks as clearly to our twenty-first century condition as he did to that of his own spiritual family. 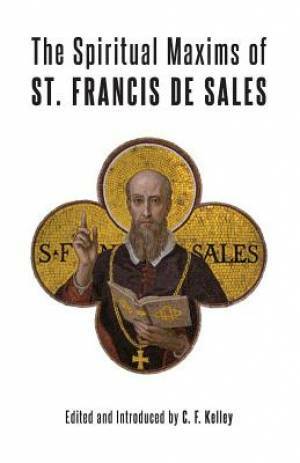 The Spiritual Maxims of St. Francis de Sales by St Francis De Sales was published by Angelico Press in May 2014 and is our 47926th best seller. The ISBN for The Spiritual Maxims of St. Francis de Sales is 9781887593212. Be the first to review The Spiritual Maxims of St. Francis de Sales! Got a question? No problem! Just click here to ask us about The Spiritual Maxims of St. Francis de Sales.